With its sandy beaches, dunes and brackish marshes, forests and open grasslands, Cape Cod of yesteryear was a wild, untamed place. Hardwood forests of oak, maple and cherry were home to packs of wolves and black bears. Overhead, birds of prey including owls and hawks thrived in these woods. Freshwater rivers and ‘kettle’ ponds were carved by retreating glaciers with yellow perch, brook trout and chain pickerel left behind. Offshore, humpback and right whales numbering in the thousands migrated to and from Cape Cod Bay, Nantucket Sound and the open Atlantic to the east. But how did the white colonists change the landscape and shore? What invasive species of birds, fish and animals exist here now? Why, when and how did we as a culture shift from killing many of these animals to desperately attempting to conserve them, and their habitats, too? 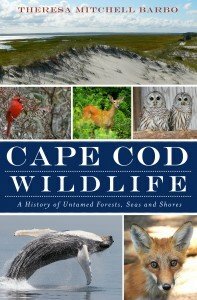 Those looking for a comprehensive immersion into Cape Cod’s wild and natural past will find this latest book by Historian Theresa Mitchell Barbo an engrossing read. They figured the Nor’easter was a death mission, but four young Coast Guardsmen, sustained only by guts, faith and duty, steered the humble 36’ motor life boat, the CG36500, into the belly of the storm anyway the night of February 18, 1952, some five miles off Chatham, Cape Cod. Coxswain Bernie Webber, Richard Livesey, Ervin Maske and Andy Fitzgerald returned to port hours later very much alive and with thirty-two survivors from the 503’ oil tanker, the Pendleton. Their stormy voyage would be known as the greatest small boat rescue in Coast Guard history, and an exemplary example of maritime leadership. 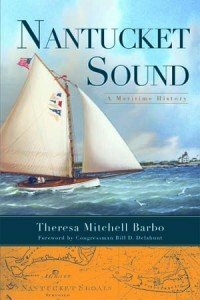 In this acclaimed, true account, maritime historians Theresa M. Barbo and Captain W. Russell Webster (Ret.) skillfully recount the hour-by-hour drama in this definitive publication used at the Leadership Development Center at the United States Coast Guard Academy. The Walt Disney Corporation is turning the rescue story into a major motion film (not connected to this book) to be released in 2016. 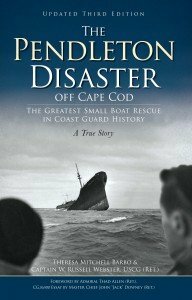 Exclusive to The Pendleton Disaster Off Cape Cod: interviews with all four Gold Medal Lifesaving Crewmen from the CG36500 and Charlie Bridges, then a young sailor rescued from the Pendleton in ‘52. On Nantucket Sound, even today the wind carries the silent voices of ghosts of this ancient fishing ground, vital shipping passage and final resting place for vessels unable to navigate its shallow sand bars. Nantucket Sound was like a giant city on water with tourists aboard steam ferries, captains and sailors on their schooners, and fishermen heading out, going one way or another, crisscrossing waves between Nantucket, Martha’s Vineyard and Cape Cod. Shores were littered with aids to navigation: of forty-four lighthouses constructed in Massachusetts between 1746 and 1961, thirty-nine were in Cape Cod waters, many in Nantucket Sound. Read about this iconic and celebrated patch of ocean by Theresa M. Barbo, one of Cape Cod’s leading maritime writers. In the 1630’s, European settlers built a fresh civilization out of forests and sand on which Native Americans had long wandered and thrived, and in mere decades this part of Massachusetts was changed forever. 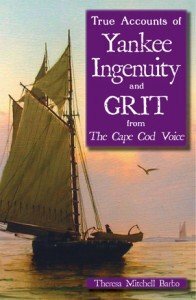 Explore Cape Cod’s history through a fresh perspective in over forty imaginative and beautifully composed true stories that span the 17th thru 20th centuries by Historian Theresa Barbo. By 1705, Thomas and Hannah Paine of Truro had fourteen children. What was it like to raise a large family then? The British terrorized Cape Codders during the War of 1812. And Private John J. Ryder of Brewster wrote his mother during Christmas 1862 from a Civil War battleground in Virginia that he was “wet, cold and hungry, and I can think of nothing that could add to my misery.” On March 12, 1902, seven lifesavers perished in the infamous Monomoy Disaster. You’re invited on a literary journey through the joys, achievements, despair and endurance of real people of yesteryear whose stories will live on forever. 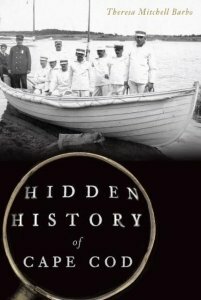 Cape Cod’s secretive and buried past is unearthed by Journalist and Historian Theresa Barbo whose unique essays reveal the quirky and remarkable character that is this sandy arm of Massachusetts.